When David Reichelt ’13 (Theatre), creative director for the mobile game Color Switch, spoke at California State University, Northridge earlier this year, he encouraged many students to reach their seemingly impossible dreams by working hard. Among the audience members, Reichelt’s words ignited a spark in graduate student Jonathan Wong ’15 (Multimedia Production), who had dreamed of developing his own mobile game but did not have much programming experience. 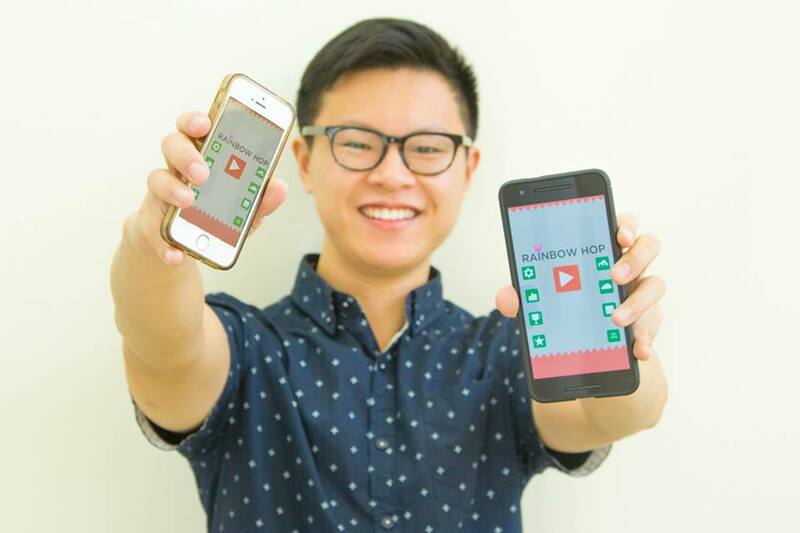 Inspired by Reichelt — who also didn’t have much programming experience when he started developing Color Switch (which launched Dec. 6, 2015) — Wong began to realize his ideas for a gaming app and launched his first side-scroller mobile application, Rainbow Hop, after just two months of development. Now available for free on iOS (Apple) and Android devices, Rainbow Hop challenges users to control an animal character through an environment filled with colorful obstacles. The player taps the screen to pass through obstacles of a certain color and avoid other colors. Players can unlock new characters or increase the level of difficulty. Wong said he always dreamed of developing video games, but had many doubts about spending his time on something he had no experience doing. Despite his fascination with video games, Wong rejected the prospect of becoming a game developer early on. “Math was always one of my weaker points, and I heard that computer science requires a lot of math — so I dismissed the idea right away,” he said. But after Reichelt’s talk, Wong overcame his doubts and gave his passion a chance. He learned a few programming basics from an introductory Java Script course he took at CSUN. Over the summer, he also took online videos and workshops. Wong got the initial idea to develop the game when CSUN multimedia professor Jacob Enfield recognized Wong’s potential and told him about GDC, the annual Game Developers Conference in San Francisco — where successful game developers talk about their products and experiences. Wong decided to download the talks on podcast and use his one-hour daily commute from the San Gabriel Valley to CSUN to listen to them. The key lesson Wong learned, he said, was the importance of taking risks — at any time in life.